This utility gaiwan is optimised for shorter gongfu infusion ergonomics, with wider diameter to depth ratio and excellent curve of the tea bowl brim for heat dissipation. Classic lid button wall design also for ease of handling. Matches well with Toffee Brim Shooters in the same Jianzi series. Same high quality glaze as the beautiful Tall Foot 150 selections. Although this is a gaiwan developed with the requirements for standard tea tasting, at 150ml ISO capacity at below the lid cover, we have it made with all the proper ergonomic requirements, and in a great looking design. Produced in fine kaolin porcelain and gorgeously finished with a glossy overglaze. A great tool for the professional, the real connoisseur or the novice drinker. 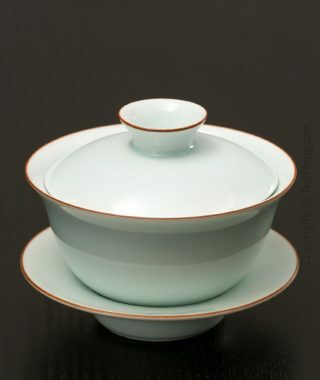 Each unit contains one gaiwan bowl with a lid. Choice of three colours. Dehua in Fujian has been a famous porcelain centre since the Song Dynasty. 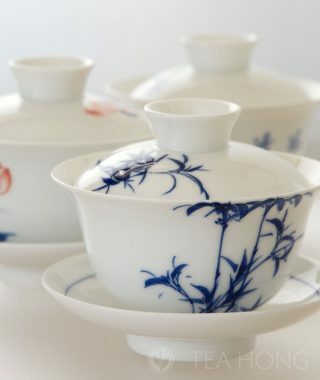 The tradition of fine white porcelain that has a dense, warm white presence still strives today. We call it jade white, for easy reference. Rushi is the workshop which produced this series for us. This 165 ml capacity design is great for use both as an infusion ware and as a cup. Individually hand-painted. Set of two gaiwans. Select from the bamboo motif or the lotus motif, or one each of the two designs. 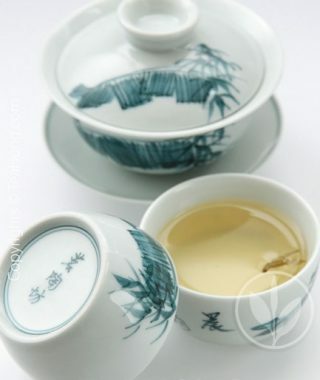 There is more value in this gaiwan than the nice painting, or the use of finer materials or smoother finishes. The mould casting of the body is a lot more even than most other commercially produced vessels. This helps to maintain a steady convection of the hot water during infusion for a smoother liquor, when your tea appreciation skills have evolved to such a stage as to require for that. Available also in the set with a different painting. 150 ml is an important capacity for infusion vessel, because this is one of the standard sizes specified by ISO for preparing tea for tasting. 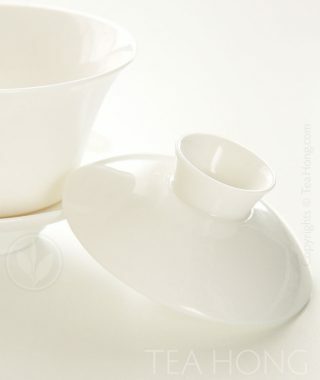 That is also why we think this classic bell shape white china gaiwan is so useful as a utility infusion ware. It is also a large enough size for serving up enough tea using the gongfu approach, yet small enough for most hand sizes to handle. Produced by a very small studio in Chaozhou ( the "capital" of gongfu tea ) using a half-mould, half-handmade process, the thinness at brim of the bowl is ideal for smooth liquid flow and heat management. Choice of white porcelain and bone china. Fine kaolin porcelain styled in precise curves with impeccable finishes. Each individual vessels hand painted and signed. The peach graphic motif echoes the traditional Chinese auspicious icon for health and longevity. 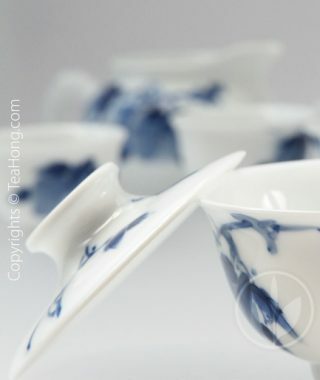 Almost perfect width-height proportion in the gaiwan for gongfu infusion. A classic showpiece from the famous porcelain capital Jingde in China. 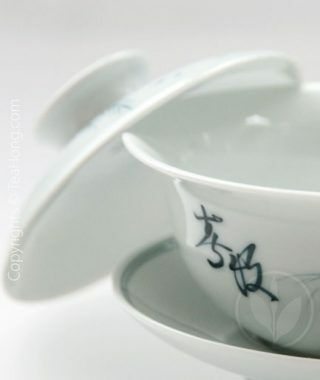 There is more value in this gaiwan than the nice painting, or the use of finer materials or smoother finishes. The mould casting of the body is a lot more even than most other commercially produced vessels. This helps to maintain a steady convection of the hot water during infusion for a smoother liquor, when your tea appreciation skills have evolved to such a stage as to require for that. 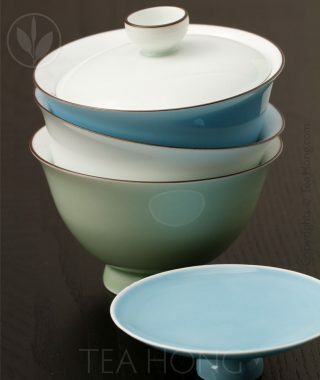 Available also as a single gaiwan with a different painting. 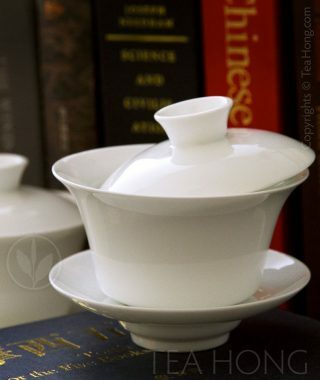 This fine bone china utility gaiwan is ideal for preparing tea using the gongfu style. We have priced it so reasonably that you can stock up a quantity of it for your private tea tasting parties, or can even use them as cups.